Figure 1. 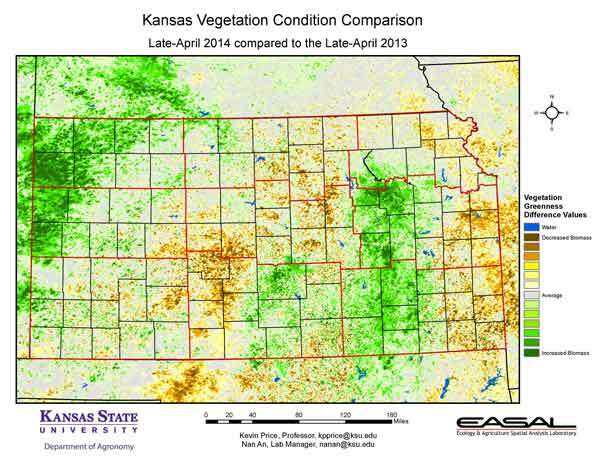 The Vegetation Condition Report for Kansas for April 15 – 28 from K-State’s Ecology and Agriculture Spatial Analysis Laboratory shows that photosynthetic activity is greatest in south central Kansas, where temperatures have been warmer. Figure 2. 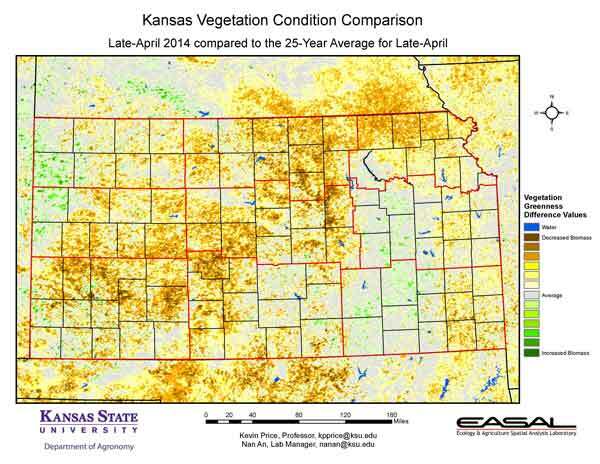 Compared to the previous year at this time for Kansas, the current Vegetation Condition Report for April 15 – 28 from K-State’s Ecology and Agriculture Spatial Analysis Laboratory shows that the Flint Hills and northwest Kansas have much higher NDVI values. In the Northwest, while drought continues, there was more fall moisture than in the previous year. In the Flint Hills region, temperatures are closer to normal this year. Figure 3. 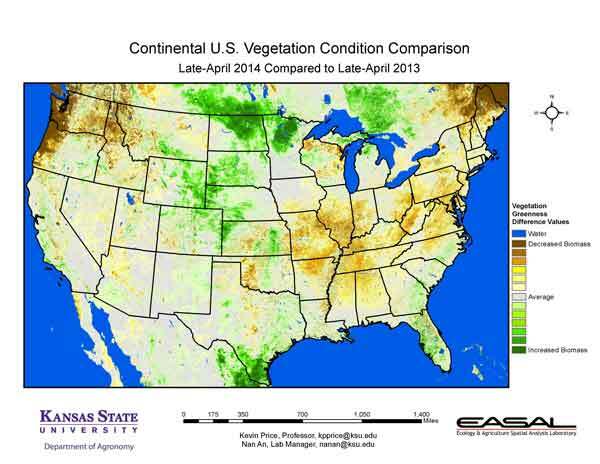 Compared to the 25-year average at this time for Kansas, this year’s Vegetation Condition Report for April 15 – 28 from K-State’s Ecology and Agriculture Spatial Analysis Laboratory shows below average vegetative activity from the Southwest through the Central Divisions into the North Central and Northeastern Divisions. Reasons for this low level of activity vary. In the Southwest and Central Divisions, dry soils have limited vegetation. In the North Central and Northeast, cooler temperatures have been a major factor. Emerging drought in east central and southeast Kansas, coupled with cooler-than-average temperatures, is also impacting biomass production. Figure 4. 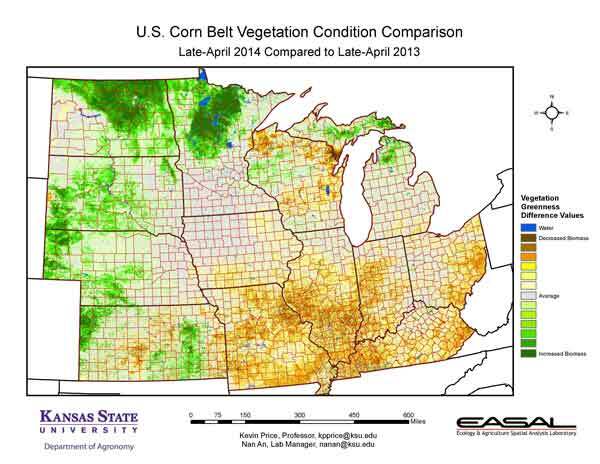 The Vegetation Condition Report for the Corn Belt for April 15 – 28 from K-State’s Ecology and Agriculture Spatial Analysis Laboratory shows that vegetative activity has been slow to develop, particularly along the northern portions of the region. Cooler-than-average temperatures have had the biggest impact on the low NDVI values. In the southwestern part of the region, extremely cold temperatures at the beginning of the period further damaged vegetation already under drought stress. Figure 5. 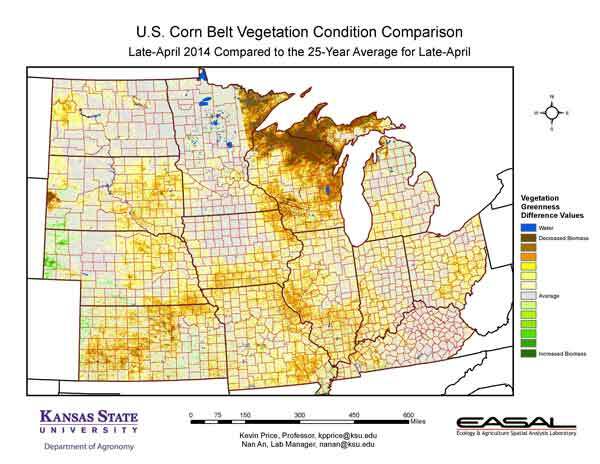 The comparison to last year in the Corn Belt for the period April 15 – 28 from K-State’s Ecology and Agriculture Spatial Analysis Laboratory shows patches of higher biomass production in North Dakota and Minnesota. These areas have a quicker melt of the snowpack than has been the case in Wisconsin, allowing for greater vegetative activity this year. Figure 6. Compared to the 25-year average at this time for the Corn Belt, this year’s Vegetation Condition Report for April 15 – 28 from K-State’s Ecology and Agriculture Spatial Analysis Laboratory shows that the upper Great Lakes continues to have the greatest lag in biomass production. Persistent cold and snow have delayed plant development in the region. 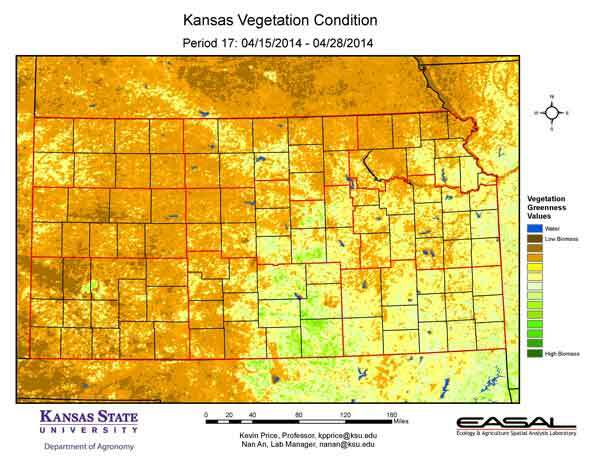 A mix of colder weather and drought have reduced vegetative activity in Kansas. Figure 7. 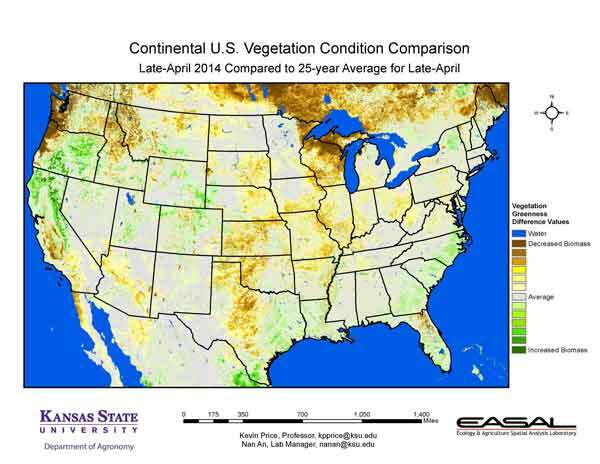 The Vegetation Condition Report for the U.S. for April 15 – 28 from K-State’s Ecology and Agriculture Spatial Analysis Laboratory shows that greatest vegetative activity is in the Southeast. Heavy rains along the Gulf Coast have created problems in the region. In the Pacific Northwest, the amount of high biomass activity is decreasing. Figure 8. The U.S. comparison to last year at this time for the period April 15 – 28 from K-State’s Ecology and Agriculture Spatial Analysis Laboratory shows that the biggest differences are in the Northern Plains, where less snow remains this year than last year at this time. Figure 9. The U.S. comparison to the 25-year average for the period April 15 – 28 from K-State’s Ecology and Agriculture Spatial Analysis Laboratory shows that the biggest departures are in the Pacific Northwest and the Upper Great Lakes. In the Upper Great Lakes, lingering cold temperatures and snow have delayed plant development. 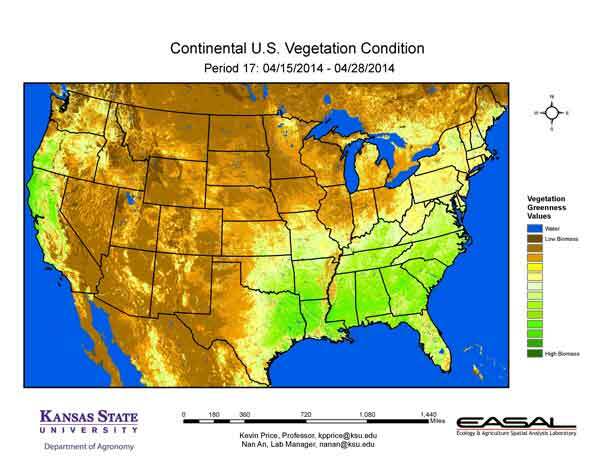 Impacts of dry conditions can be seen from central Texas into north central Kansas, as vegetation is slow to develop.